Diagnosis: Little Blue Herons are medium-sized herons with a maroon-brown head and neck. They have a small white patch on their throat and upper neck and a bluish body and a black tipped bill. Their legs are colored gray to green and they become black during the breeding season. Immature birds are mostly white with yellow to green legs. Natural History: Males try to attract females by stretching their necks upward with their bill pointing up while assuming a crouched position. They then begin to snap their bill, sway their neck and vocalize. When a female approaches, they nibble each other's feathers and cross necks. Males will then gather sticks for the female to prepare a nest above ground or water. 3-5 blue-green eggs are laid in April over the course of 5-8 days, with one egg laid every other day. Both male and female will incubate the eggs for 22-24 days until hatching occurs. By 42-49 days, the young are fully capable of flight and are on their own. Little Blue Herons reach sexual maturity by 1 year. 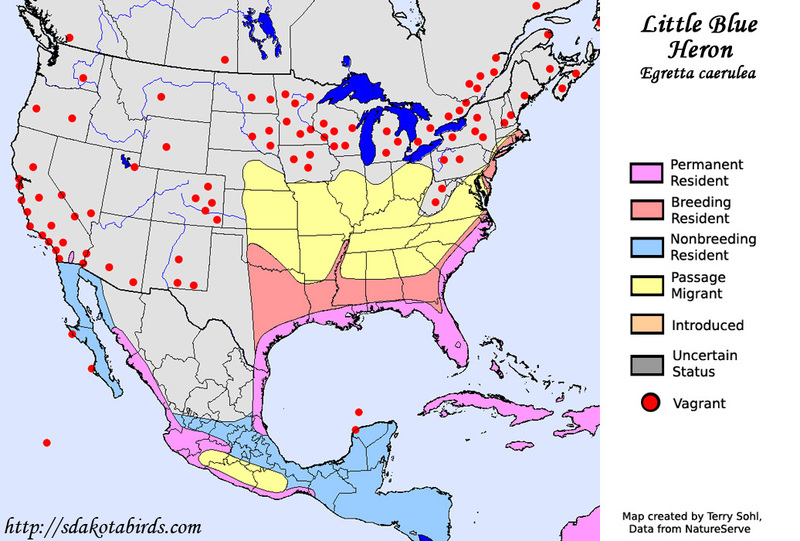 Distribution: This species is found throughout most of North America. They range from Alaska and southern Canada south to South America. However, they are permanent residents along the Gulf Coast and the Caribbean Islands. They breed in the southeastern states from Texas east to the Carolinas. Habitat: This species prefers freshwater environments such as lagoons, marshes, swamps, lakes, and ponds and can also be found in flooded areas of grasslands. Diet: Little Blue Herons are carnivorous. Their diet usually consists of crustaceans, insects, spiders, fish, frogs, lizards, snakes, and turtles. Katusic, P. 1998. "Little Blue Heron" (On-line). Accessed July 24, 2011 at http://www.inhs.uiuc.edu/chf/pub/ifwis/birds/little-blue-heron.html. Rodgers, Jr., James A. and Henry T. Smith. 1995. Little Blue Heron (Egretta caerulea), The Birds of North America Online (A. Poole, Ed. ).